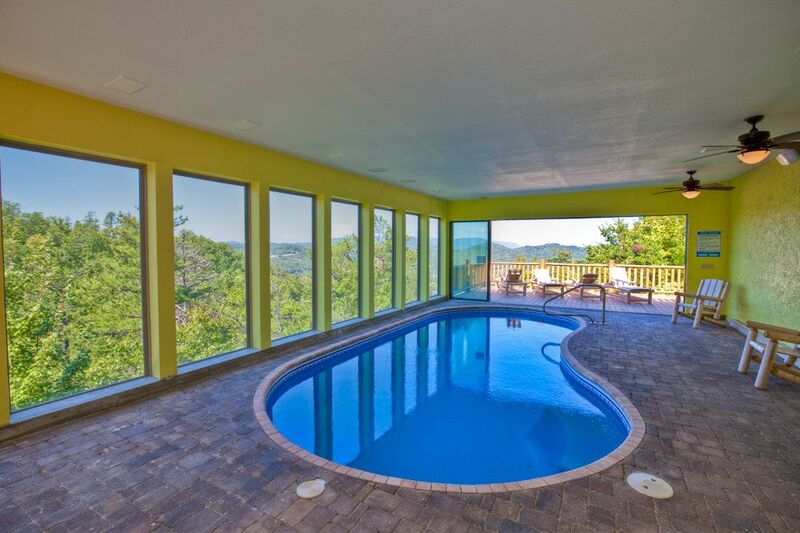 Million Dollar View is centrally located just a few miles away from the main strip in Pigeon Forge, with easy access to Dollywood/Splash Country, Downtown Gatlinburg, Ober Gatlinburg Ski Resort, Ripley's Aquarium, Wahoo Ziplines, & dozens of Great Restaurants & Entertainment. Master has tile and glass block shower and jacuzzi tub. Worked with Barb for some items to be dealt with. She took care of all our needs and made our stay a memorable one. Cabin is spacious and comfortable. Beautiful cabin with an amazing view! My friends and I just returned from our stay at Million Dollar View. I would highly recommended this cabin to any group of 8-14. The cabin is very spacious (bigger than I thought it would be based on the pictures). It is quiet and private, I did work on the deck most mornings enjoying my coffee and the view. It's close to Gatlinburg Pigeon Forge if you want to shop, play mini golf, or eat at one of the many restaurants. We went on several hikes throughout the national park. The cabin shares the indoor pool and fire pit area with Cooper Top cabin (it is a separate building in between the two cabins). We only saw the guests from the other cabin at the pool one day due to differing schedules and spent 3 nights by the fire pit and never saw the other cabin guests there. The 4 bedrooms were great. The sofa sleeper (1) and futons (2) provided bedding but weren't the most comfortable. The kitchen was nice and well equipped with what you should need. We had an issue with one of the showers upon arrival, but I called to report the problem in the afternoon and it was fixed the very next morning. The road leading to the cabin is steep. Although it was not our favorite part of the trip, the view from the cabin made it worth it. We had 2 suvs and 2 cars, (none of which had 4WD) and all of them were fine. However if yo have the option of 4WD it would probably be best. We were there in the summer so I'm not sure how it would be in the snow, but my guess would be very challenging. We just returned from a stay at Million Dollar View. Upon arriving was a bit surprised at the driveway. I didn't know such a thing existed. Although steep, we made it every time. The best advice is just to take it slow and put the transmission in low. You cant get in a hurry going up this drive, and you cant get much of a run at it. The home was very nice. Upon arrival we quickly noticed the gas fireplace and grill did not work. We called maintenance and he said he was too busy to come, and that I should just call him the next day and he would try to talk me through lighting the fireplace and that the auto lighter on the grill was too expensive to repair and I should just use a lighter. However, we didn't have a lighter and they didn't supply one. I kind of thought for what was paid per night they would spring to either fix it or supply a $2.00 lighter. So we went in town the next day to get the lighter, and while there, apparently they changed their mind and came and fixed the fireplace and left a lighter, which was nice. They have a really cool big ceiling shower in the master bedroom. Someone spent some money to make this nice shower, however, they have horrible water saver shower heads on them, and they don't let enough water out and it loses all the effect with these tiny jet like streams. So, what could be really nice, was a let down. We also had a mouse that lived under the stove that would come out occasionally. With the home being large it would be a chore to clean. The ceiling fans would spit off clumps of dust as they are really caked with dust. However I don't know how you could clean them either. Definitely bring some extra towels. The pool was warm at 84 degrees the whole time. However, I would certainly go back here. Everything else was A++. Definitely a memorable week. I would highly recommend. I planned a surprise weekend for my husband with all the guys who were in our wedding and their spouses. We had a ball. The cabin was immaculate and beautiful. The views were great! We had perfect weather (in the upper 80s) all weekend so didn't need the sweatshirts we had all brought. The hot tub was great. The kitchen is big and roomy. All the bedrooms were nice sizes. There was plenty of seating for us all in the living room and kitchen area so we could eat meals together. There were tvs in all the bedrooms and a big flat screen in the living room next to a gorgeous gas fireplace. The grill worked great and was already hooked up to gas. The decking around the house is huge on both levels so we played washers and corn hole there. The downsides were not many pots and pans in the kitchen. The pool area had to be kept closed to keep it heated or the alarm went off. There were only 4 rocking chairs on the porch. I brought all the bag chairs we had from home ( they were invaluable to the weekend). The can opener was broke so bring one along and the wine opener was chintzy so would throw another nicer one in your stuff. I brought paper plates and silverware. We needed the paper plates but there was plenty of silverware for everyone. The towels weren't great but you will need a couple of beach towels for the pool and hot tub so real problem. We had a great fire on the deck above the pool on Saturday night and roasted marshmallows. There was lots of seating up there to enjoy the night and the stars. I would definitely rent this cabin again. It was a great way to spend a weekend with friends. We even had a night visit from a friendly bear and a late night visit on the porch of a fat raccoon. We will add more pots and pans to the kitchen and replace the can opener. More chairs will be added to the decks. We do not supply paper plates. We are in the process with a linen company to supply a higher quality of linens. have to keep the heat inside the pool area. Million Dollar View is centrally located just a few miles away from the main strip in Pigeon Forge, with easy access to Dollywood/Splash Country, Downtown Gatlinburg, Ober Gatlinburg Ski Resort, Ripley’s Aquarium, Wahoo Ziplines, & dozens of Great Restaurants & Entertainment. The National Park is 5 minute from the cabin. Tubing, horseback riding and swimming are less than 10 minutes away.